I really believe that Junmar Fajardo has a great future in Philippine basketball, especially in international tournaments. He has shown great potential in local leagues—consistently scoring around 30 points and grabbing 10 boards per game—and he will only get better once he faces stiffer challenges. Please post all Fajardo-related updates in this thread. ADVICE TO WANNABE WRITERS WHO ARE SENSITIVE TO WHATEVER SORT OF CRITICISM: JUST STOP WRITING. Last edited by hayden_agenda on Thu Sept. 10, 2009 9:49 pm, edited 1 time in total. bakit di nasama sa Gilas to? is it because of school commitments again??? and our schools should have been the ones teaching about NATIONALISM! there is ONLY ONE NORA AUNOR ! 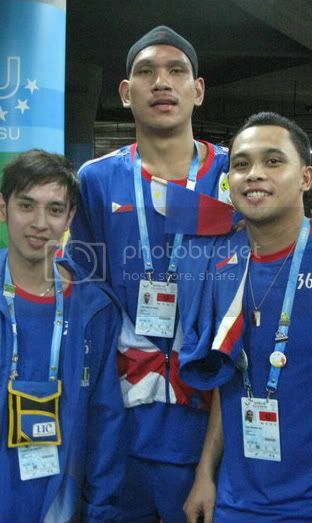 nagkakaron din kasi ng politika.. look at what happened to greg slaughter.. after he joined gilas, nasulot naman ng ateneo.. If you love your girl, set her free. If she doesn't comeback, she's with me.. Height: 6 ft. 10 in. hindi si ravena.. ateneo na sya eversince..
maybe you were talking about ryan buenafe..
ryan buenafe yan ba yung finals MVP nung 2010?? listed at 6'10 so nakasapatos yan malamang. Mga a shade above 6' 8 cgro yan pag nakapaa.